Hi y'all...long time no see!! Sorry about that - still trying to juggle everything that's going on right now. 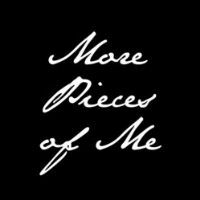 Enough about that, let's talk Friday Favorites! I haven't done it in a while, so I thought I'd do a recap of some outfits I've been wearing lately - these are some of the "most liked" from what I post on Instagram (if you already follow me I'm sorry - you've probably seen these already). I've also tried to pick the outfits where you might still be able to find some/most of the pieces. I'll link to what is still available where I can. I caught a cold from the kiddos & had to stay home for a sick day & this is what I wore. I got a couple funny comments from some friends saying that I was "dressed up" for staying home sick...that's how I role I guess :-) Anywho, these jeans are probably my favorite pair which Gina tells me are discontinued (insert sad face here). I let the Converse do the "talking" in this outfit. As you know from this post, I'm loving gingham right now. 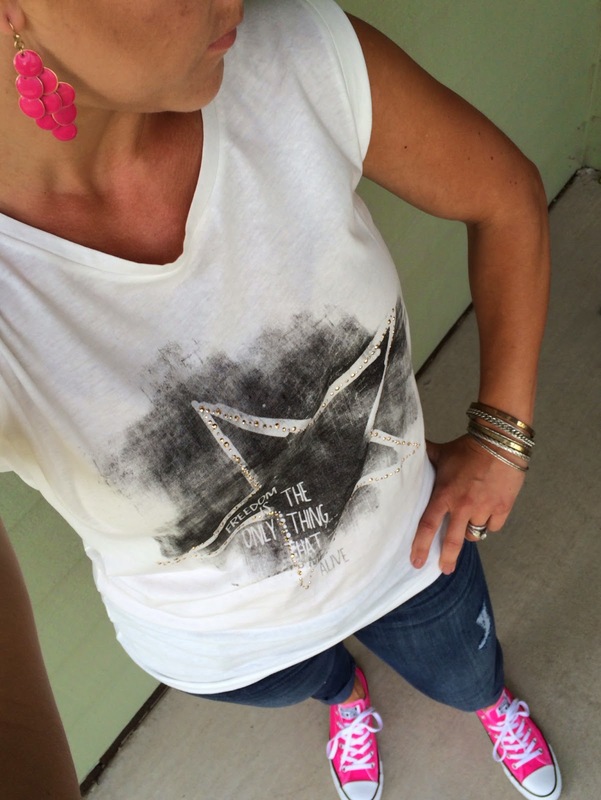 I snagged this top from the Limited during one of their "buy-one-get-one-free" sales & I love it! I owe Carylee a thank your for tipping me off about this layered beaded necklace from Baublebar...I've worn it a couple of times now & it has gotten lots of compliments each time! This dress is a new favorite of mine & is a must have! I purchased it at Old Navy during their Labor Day sale & I already know it will be on constant repeat! Very comfortable & easy to just throw on a statement necklace or scarf & you can be out the door. It would also be great to add a vest to this dress too! 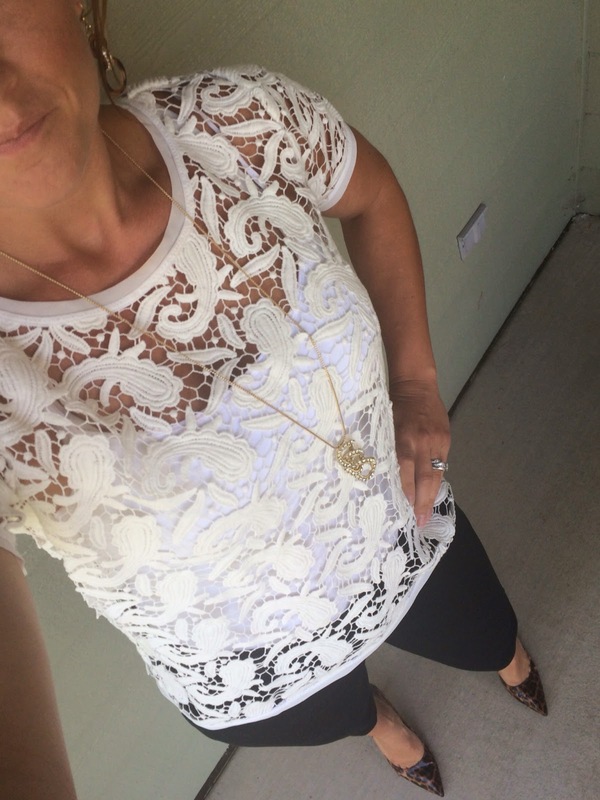 The thing I love the most about this outfit is the fact that I paid under $15 for this beautiful Paisley Lace top (check your local stores as it's still $65 online!). On this day I just simply threw on my leopard print heels & black Capri's. Done & done! Now you're up to date! If you don't already follow me on Instagram you can do so here. I try to post most of my daily outfits there if you're needing some inspiration. Until next time - Happy Friday!! Well, I love them all :) Even though I finally am on IG and get to see these, it's fun to see them in full size and get the backstory. The color of the bauble bar necklace is awesome and such a standout piece!! I love your white lace top, cobalt pumps & striped skirt, pink converse...I mean. Really it's hard to keep my comments to a reasonable length when I just like everything! I love everything! 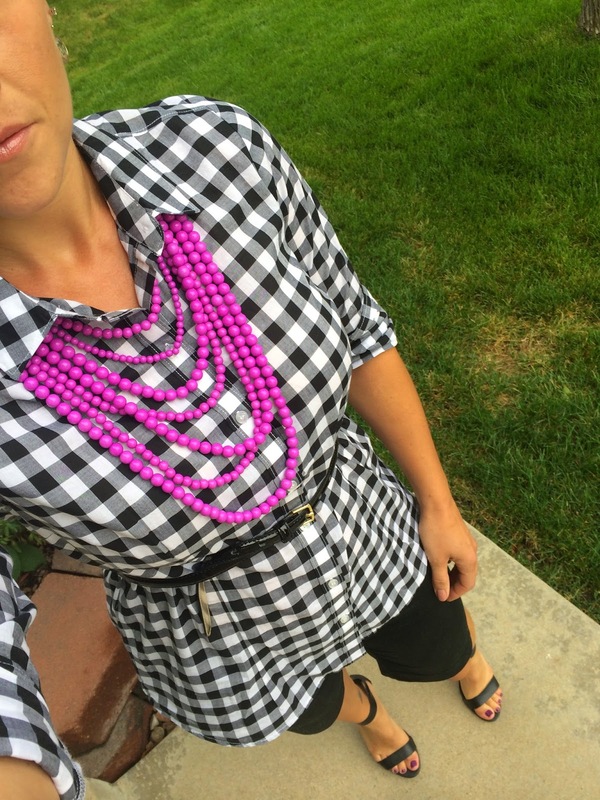 My favorite is the gingham shirt and pink necklace - gorgeous! Love the stripes and the lace is very beautiful.